Do you care about optimal hiking grade? Maybe not, but it's interesting for us to think about. Intuitively, some may think that steeper trails should get you up higher more quickly because less energy is being put into the "horizontal miles" that a less steep trail would need. However, we probably also feel that at some point something becomes too steep to ascend without the looseness of the terrain affecting our pace. So what's the "optimal" grade? Well, I'm sure the answer is unique to an individual, but let's look at one person. We previously did a little exploration into how Vertical Ascent Rate (VAR) varied with the steepness of a trail, but only with one example. Now I've combined 50 hikes worth of data. 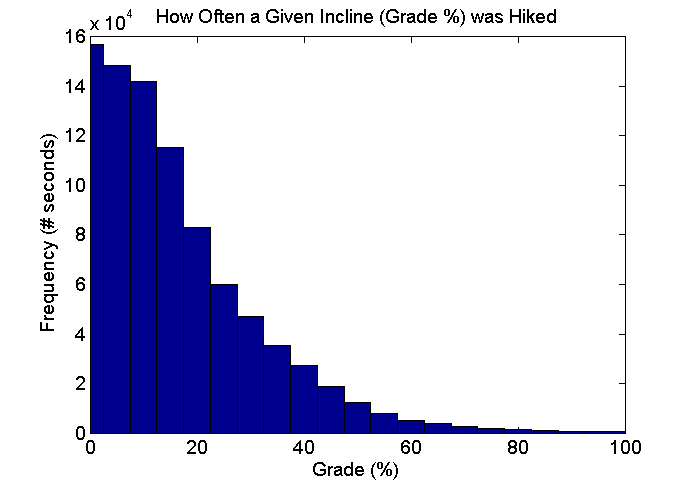 Interesting to see, but no surprise that as the terrain got steeper, it was encountered / hiked with less frequency. Was I with others, going at varied paces? Again, no surprise that speed decreases as grade increases. But let's move on to the good stuff - how does VAR vary with grade? Of course there is some variance, but we see an increase in VAR from 0% to a bit above 40%, then we see some decreasing. We see a similar trend when going downhill (negative grades) although the variance is higher. As seen in the first graph, the amount of time spent on steep slopes is much less than on less steep (<20%) slopes, so perhaps not enough conditions have been crossed to give a broad conclusion about VAR on steep slopes. But the current set includes much diverse hiking - hiking on very steep use trails, hiking off trail, scrambling, etc... And in those conditions, after 40% grade, the steepness began costing energy, likely due to looseness of terrain, brush, change in mechanics. The "why" is speculative. But the data is real. And at least for this hiker, 40% grade seems just right. I'd like to compare to this other hikers. If you have a collection of GPS files you wouldn't mind sending me, I'd like to perform this analysis on others' data. Oh id love to compare! I use my Garmin Foretrex 401 for my hikes. I'll try to get my stuff together and i'll let ya know. Just starting Strava today... 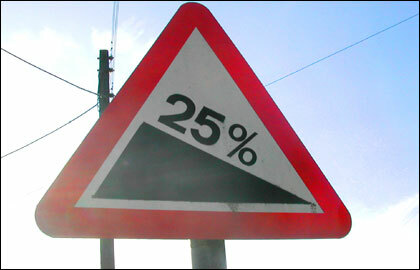 Doubt I ever get on anything so steep as 40%... but?? Maybe in time I'll have some data to share. Fun stuff!